Small and midsize firms virtualize IT infrastructure to meet real-world challenges: simplifying operations to focus on business issues, speeding up application rollouts to get more done, safeguarding data and operations to stay open and productive, and saving money for the bottom line. 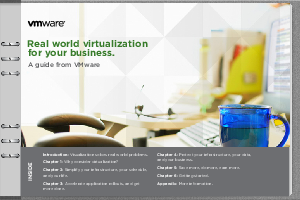 It's a new way to think about IT-and getting started is easy, fast, and inexpensive, using VMware solutions designed for your real-world small or midsize business. Read this eBook to learn more.